Accueil Produits Bande originale La bande originale de “Révélations”. 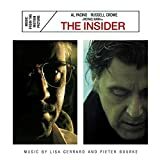 Compositeur : Pieter Bourke, Lisa Gerrard, Michael Brook et Gustavo Santaolalla. Sortie : 26 octobre 1999. Dawn Of The Truth – 1:59. I’m Alone On This – 2:02. LB In Montana – 0:50. Rites (Special Edit for the film) (par Jan Garbarek) – 5:33. Safe From Harm (Perfecto Mix) (par Massive Attack) – 8:11.